Saddleback Worship - The Overflow Devo - At Saddleback Church there is a sweet unity among all of the campuses globally that has helped fuel a new sound of celebration, freedom, and surrender. Each song from Saddleback Worship is created out of a deep love for God and a desire to keep Him first. In this 7-day devotional in partnership with The Overflow Christian Music Streaming Service, Saddleback Worship helps us grow our desire to keep God first. Most of us are waiting for something. A healing, a restored relationship, a financial breakthrough, a new job. We can often feel closed in with no way out. Sometimes we find ourselves in a pit dug by our own hands. The choices we have made have resulted in wounds that we can blame no one else for but ourselves. And so we wait for a breakthrough, a rescue. 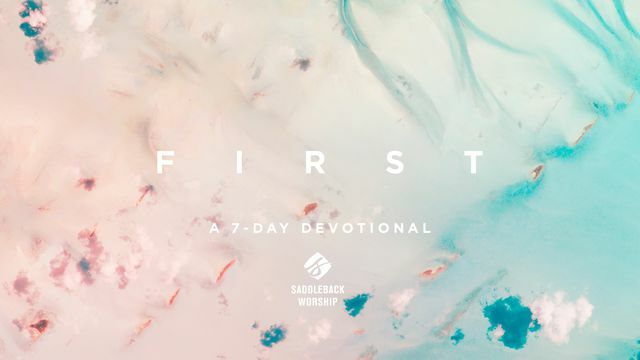 Saddleback Worship’s latest EP is called FIRST. We have always said that Saddleback Worship is more than music. Our teams will be about love, community, growth, collaboration, and serving—and that anything and everything we do will be under the banner of the name of Jesus. Our primary goal has been to love him first and seek him first. And if, out of a foundation built on Jesus alone, new melodies and new lyrics would spring up and pour out, then we would be honored to join God on that journey. These are our new songs of freedom, celebration, and surrender. No matter where you are or where you’ve been, our prayer is that these songs would breathe hope into your life. Prayer: God, you are our firm foundation. Thank you for lifting us out of the slippery places of shame, insecurity, and doubt, and planting us on a rock marked by restoration, forgiveness, and renewal. Thank you for giving us a new song to sing. We love you first and always.